Admissions to MBA/MMS through Centralized Admission Process (CAP) conducted by DTE Maharashtra are open for Maharashtra domicile as well as for outside Maharashtra State (All India) candidates. The candidates securing Non Zero Positive marks/score in MAH-MBA/ MMS-CET or GMAT/ CAT/ CMAT will be eligible to get admission to MBA course in the State of Maharashtra through CAP round. Scanning & uploading of documents. Facilitate the candidate for Submission of Online Option Form. Apart from the CAP registration and participation dates, DTE announces the list of ARCs and FCs. CAP will be conducted in 3/4 rounds. 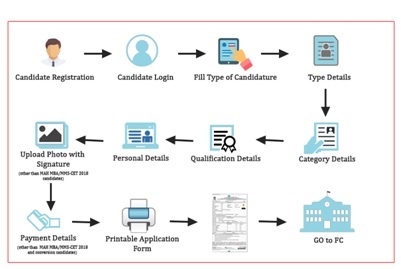 The process will consist of Online Application submission; Option form submission, document verification, counseling along with brief GD-PI, generation of merit list and allotment of MBA seat. Final allotment of seats will be based on your scores in MAHCET; CAT; GMAT, CMAT exams, academics & other parameters leading to merit score in CAP round. All India Candidature Seats: The Candidates having All India Candidature shall be eligible for these seats. Minority Quota Seats: The Candidates having Minority Candidature shall be eligible for these seats. These seats shall be filled in accordance with the various provisions of the Act. Institutional Quota Seats: The Institution can admit Eligible Candidates against 20% of the Sanctioned Intake. The maximum 5% seats may be filled in from the NRI Candidates, if it is approved by the Appropriate Authority at the Institution level. The List of the institutes identified as Admission reporting Centres (ARC) is available on the website. Since not all the MBA admissions in Maharashtra B-schools could be finalised through CAP round, there are still many vacant seats in MBA colleges. DTE Maharashtra clarifies ‘The seats remaining vacant after offering admissions to the candidates through CAP due to non-reporting and cancellation after CAP Round-III will be filled in by the managements of the respective institutes. Admission authorities of the respective institutes will have to process these admissions strictly as per the guidelines given by DTE in Annexure -III.